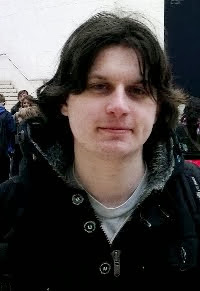 Video Games for shrimps... by shrimps The personal blog of game developer Simon Davies. Descent is another game that I feel does not get anywhere near as much recognition as it deserves, even though personally it is one of my favourite games. 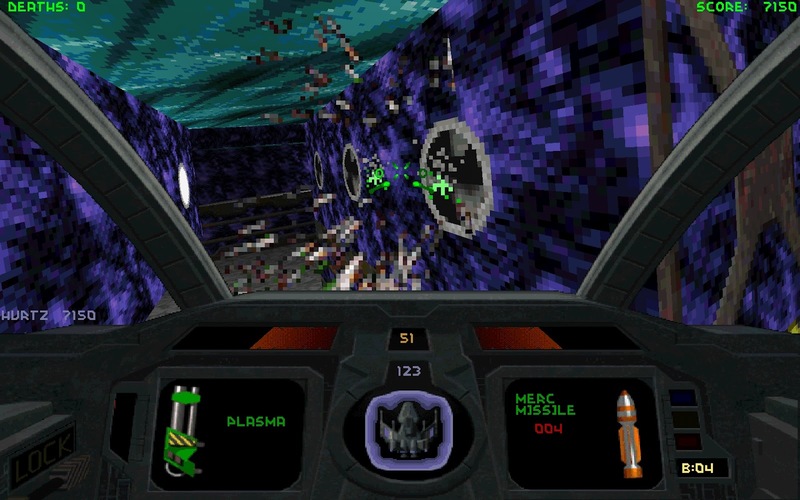 The original game was a fast-paced 3D action game classic released in 1995, just over a year after the first Doom game. 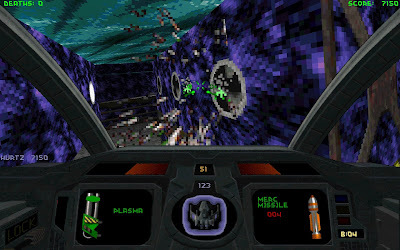 I mention this because there are many comparisons to be made with the two titles, as Descent comes from an era where the genre of first-person-shooter was more commonly known as a "doom clone." Out of the games that were released in this this time period, Descent is one of the few games that really tried to stand out from the crowd and do something very different. A lot of the basic game mechanics are still set in the time period of the original game, where coloured key cards are plenty and story is mostly non-existent and entirely optional. The basic premise is that the Post Terran Minerals Corporation (PTMC) has had all of its mining robots go a bit loopy thanks to a virus and give the task of robot genocide to the player character. The game takes place on a series of different planets throughout the solar system. In each level the player must first collect key cards to access deeper into the mine to reach the central reactor. 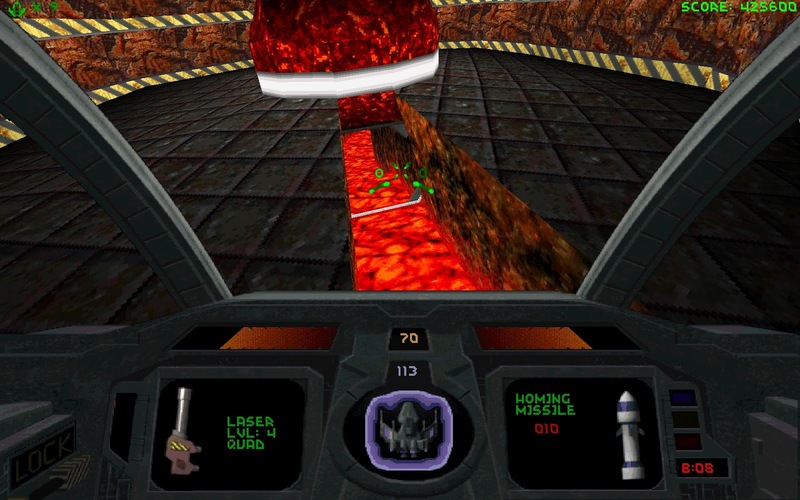 A nice twist on this basic formula though is that the player must destroy the reactor and then be able to escape the mine before it goes critical a minute or so later, meaning the player is encouraged not to destroy the reactor immediately, but instead first find the exit and memorise the path required to reach it. 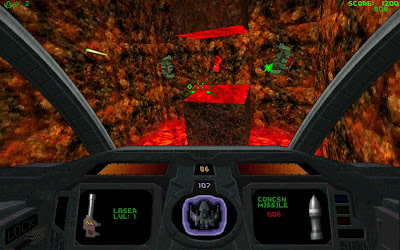 Descent II was a fairly minor update, but did add features such as dynamic and destructible lighting which is impressive for the time. Of course, all of this is wrapped around the mechanic of the complete freedom of being in a space ship. Players can move in 6 different directions as well as being able to roll, pitch and yaw. Outside of space simulations such as the old Elite franchise and flight simulations, this sort of thing was unheard of. This really did add extra dimensions of play to the game and it takes quite a lot of concentration just to be able to keep track of everything. The pre-rendered cockpit view was also a brilliant little touch, that really gave the game an extra layer of believability. Even games now are struggling with how to convey the information with the player in a way that makes sense within the game universe and back in 1995 Descent nailed it. One of my favourite things about the Descent series is the cockpit view. The way it took up a lot of the screen made the game feel a lot more claustrophobic, while also simultaneously all of the required information for the player. 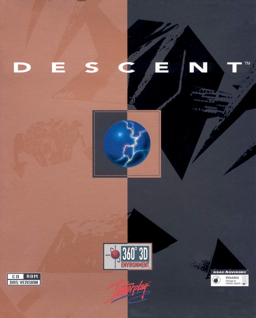 The developers of Descent and Descent II were Parallax Software, who then later split up to become two companies; Outrage Entertainment and Volition Inc. The two companies worked together to develop Descent III and Volition also went on to develop the fantastic Freespace series. Volition then began working on a fourth game in the series, however after poor sales of Descent III, the game was then turned into Red Faction. 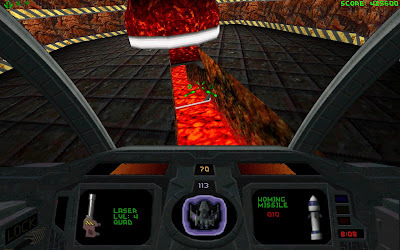 It is obvious to see how that transformation happened and I would have loved to have seen what the plan was for the Red Faction destructible geometry technology in the original plan for Descent IV. Descent III was a fairy good update on the series, but it failed to properly modernise the game back in a post Half-Life era. Poor sales lead to the sad end of the Descent franchise. Unfortunately for some reason Descent seems to have become a bit of a forgotten relic. While other games of the era have been kept alive through re-releases on modern platforms such as Xbox Live Arcade, the Descent franchise hasn't had much luck. The game would translate well to console controls and it is a crying shame that no such thing has happened. There has been a lot of mutterings about a WiiWare version although Interplay are being very quiet about this. With all of Interplay's troubles at the moment, sadly I do not feel very hopeful for any revival of the Descent franchise any time soon. Outrage Entertainment closed back in 2004 and Volition have now moved on to other pastures under THQ, so it seems likely this a franchise that is going to be stuck in the annals of history. Both Descent and Descent II are available on gog.com in this one handy pack. I would also suggest using the DXX-Rebirth Source Port for running this at proper resolutions on modern systems. Made by Simon 'The Shrimpman' Davies. Don't ask where the name Shrimpman came from, as I don't know. Awesome Inc. theme. Theme images by Jason Morrow. Powered by Blogger.